The Together We Cope service area is bounded by 87th Street on the north, Will-Cook Road on the west, 183rd Street on the south, and Western Avenue on the east. The Mount Greenwood area is not included because it is a part of the City of Chicago. 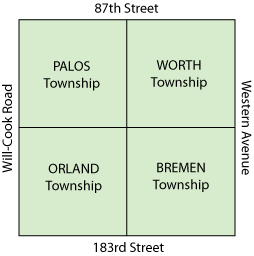 Our service area includes the townships of Bremen, Orland, Palos, and Worth. We serve Alsip, Chicago Ridge, Crestwood, Evergreen Park, Hickory Hills, Hometown, Merrionette Park, Midlothian, Oak Forest, Oak Lawn, Orland Hills, Orland Park, Palos Heights, Palos Hills, Palos Park, Posen, Robbins, Tinley Park and Worth.